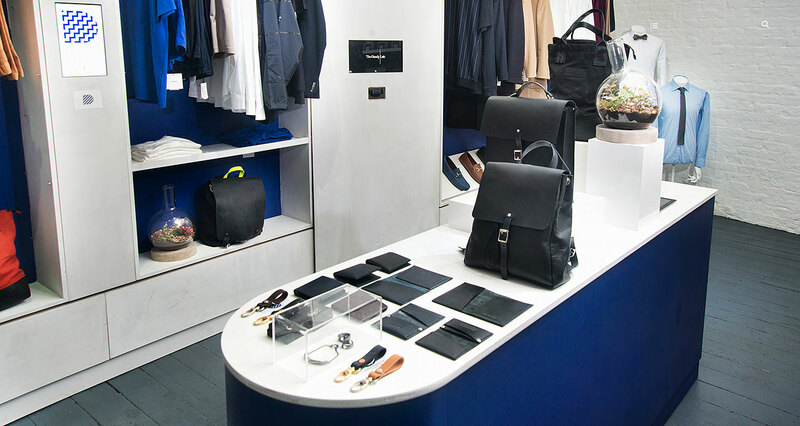 The Dandy Lab was an interactive men’s lifestyle shop. It curated and sold British brands and told their stories like a real-life magazine. Powered by University College London, the shop was based at 73 Brushfield Street in London’s iconic Old Spitalfields Market and was part British fashion shop and part retail lab testing cutting edge technologies. The pop up concept shop traded over a 6 month period, during which time The Dandy Lab team worked closely with retail tech companies and independent lifestyle brands to explore and define the blueprint of shops of the future. Fast moving mobile technologies have a significant impact on shopping habits so retailers must adapt quickly and implement technologies relevant to their target customer demographics. We created the retail lab to continually iterate the design of the customer journey and help nurture better solutions to address the mindsets of the tech-savvy millennials. The lab provided a perfect environment for us to test innovative retail technology and offer feedback to the companies so they could iterate and improve their solutions.